You might think that Singapore already has its fair share of Thai eateries and yet we have new ones popping up every now and again. Soi Thai Soi Nice has just opened last December 2016, serving authentic Thai dishes prepared by Head Chef Olay, using recipes that have been developed over his 19 years of experience in the kitchen. While the restaurant is located within a rather unfamiliar shopping mall known as Alexandra Central, it still draws a decent lunch crowd and we thought we’d check it out for ourselves. 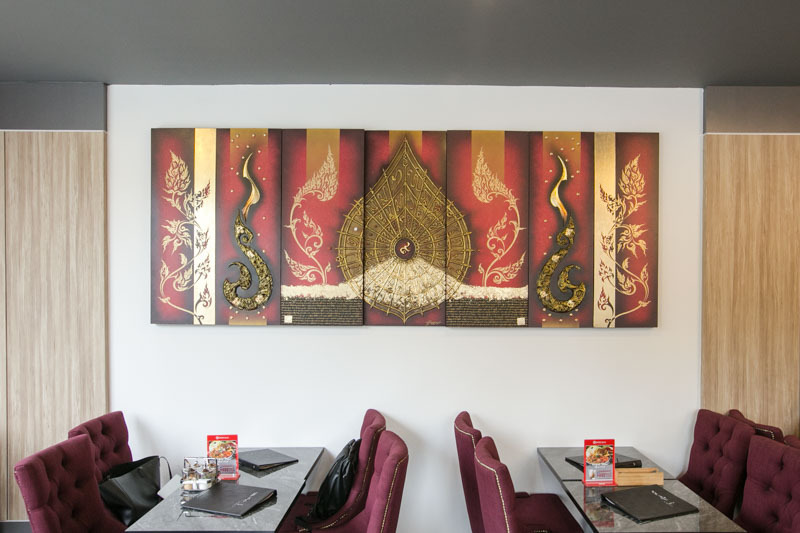 You know you can expect to be treated like Thai royalty here given the classy vibe of the restaurant’s interior. The use of comfy royal purple cushion chairs and black marbled tables make dining that much more pleasant. There is even a faux chandelier hanging from the ceiling as a centrepiece in the restaurant. After a quick look around, we were ready to tuck into our feast fit for a Thai King. Thai Milk Tea tends to be the drink of choice whenever we dine at a Thai restaurant. Choosing to be a little indulgent, we ordered the Coco Paradise ($6.80) which is essentially Thai Red Tea with a scoop of coconut ice cream. 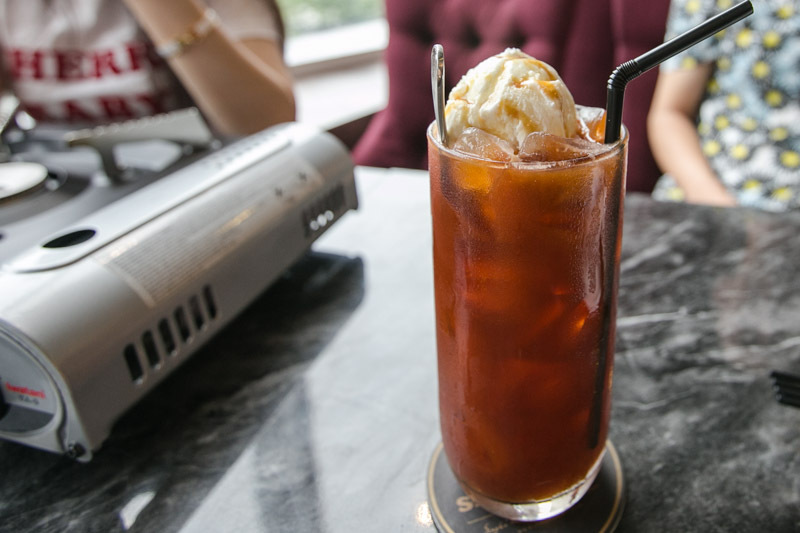 Each sip was pleasantly fragrant and smooth as the coconut ice cream melted and fused together with the Thai Red Tea. 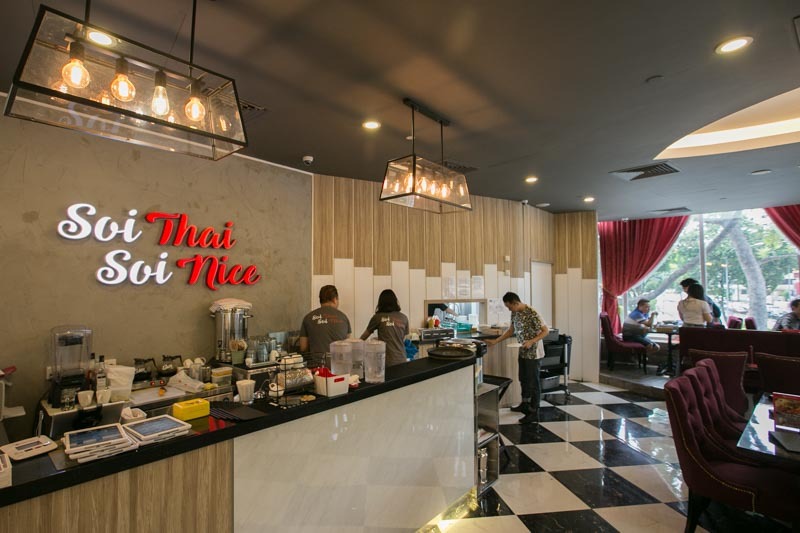 If Thai Tea is not your go-to drink, Soi Thai Soi Nice offers a variety of other drinks such as the Iced Lemongrass Lime ($3.80), that is sure to get your taste buds ready to combat the heat from the impending spices. 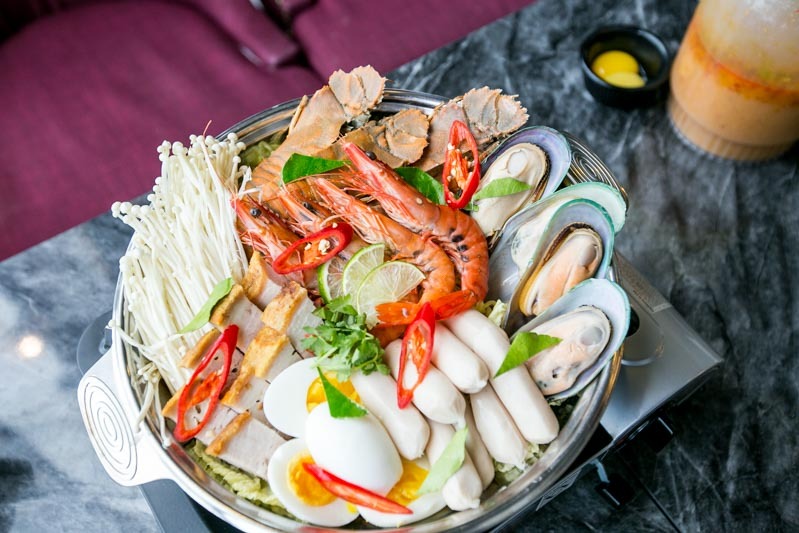 We were amazed by the generous portions of seafood and other ingredients that are part of the Royal Thai Hot Pot ($38.80 – 2 pax/ $68.80 – 3 to 4 pax). The hot pot arrived at our table beautifully arranged, while the tom yum soup in poured in after being served. 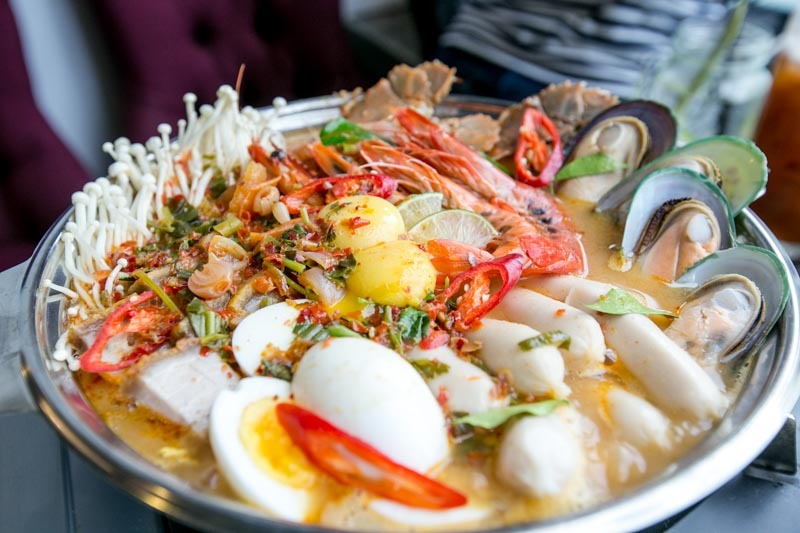 The Thai Hot Pot includes two whole crayfish, four mussels, four prawns, thick cuts of roasted pork belly, chicken chipolata sausages, hard boiled eggs, enoki mushrooms, cabbage leaves and instant mama noodles at the base to soak up the flavourful tom yum stock (made from scratch!). You won’t have to worry about portion sizes as the four of us could barely finish the entire Thai Hot Pot on our own. The only slight letdown was that the seafood ingredients are pre-cooked when served, hence, getting the prawns and crayfish out of their shells proved a little difficult after they’ve been sitting in the stock for a while. The roast pork and chicken sausages were delicious and added a meaty depth to the combination of sweet, sour and spicy flavours. The best part? The tom yum soup is refillable as part of the hot pot set. 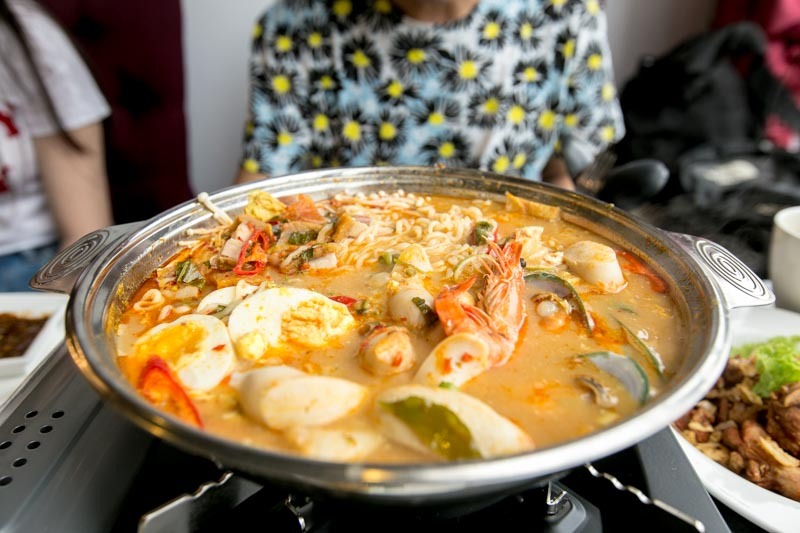 To accompany your Thai Hot Pot experience, Soi Thai Soi Nice offers a wide variety of dishes that are commonly found in the land of smiles. 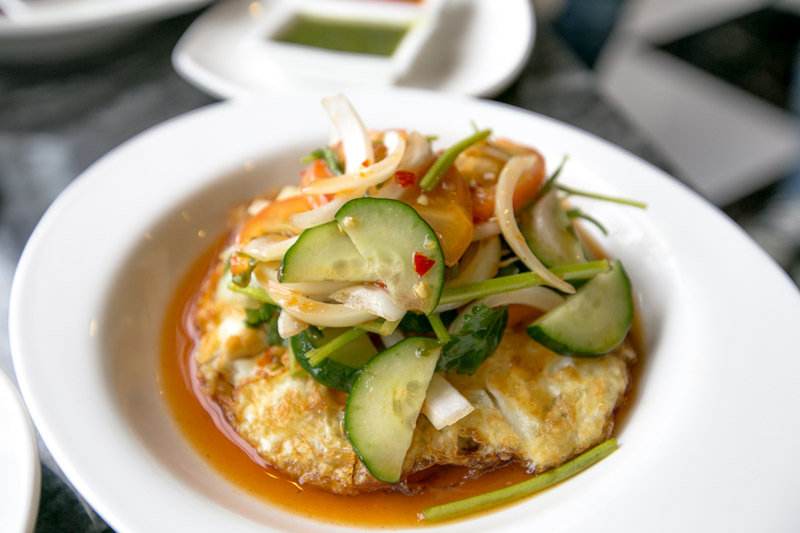 The Fried Egg Salad ($6.80) features a crisp fried egg topped off with a medley of vegetables, such as sliced cucumbers, onions, tomatoes and parsley. A dressing made from fish sauce, tamarind juice and Thai chilli sauce is drizzled over, whihc made for a mouth-watering dish. We’ve all had our fair share of omelette dishes but this was our first time trying an omelette made with the Thai herb Cha Om (Acacia Pennata). 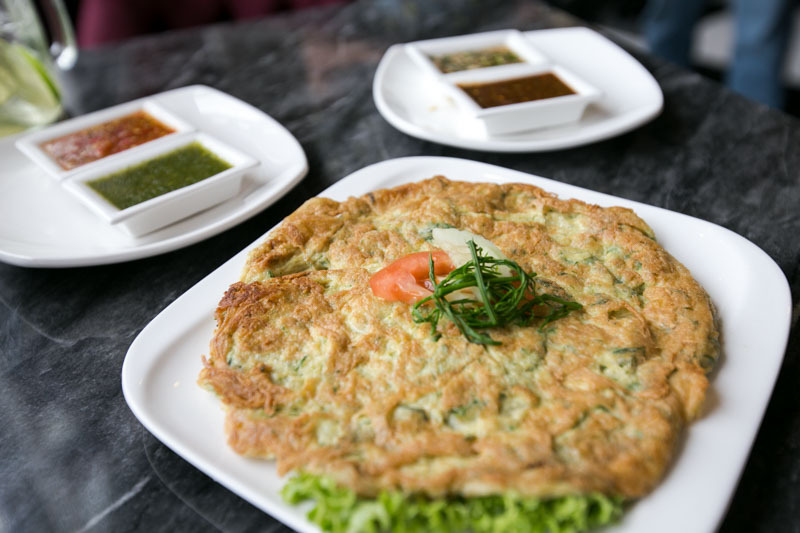 The Cha Om Omelette ($7.80) is fluffy and crisp around the edges with the strong perfume of the herbs coming through. While we were warned that some might find the Cha Om to be too overwhelming, we actually liked how it paired really well with the crispy omelette. No harm giving it a try! 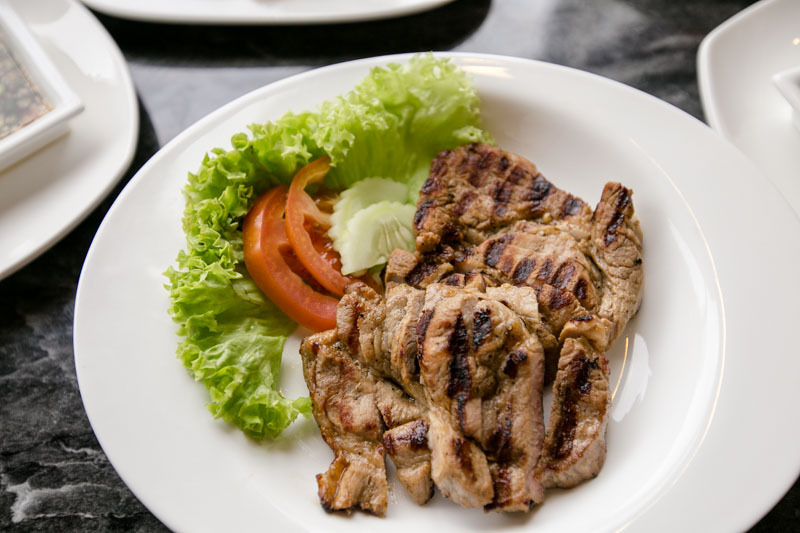 Grilled pork can be easily found on the streets of Thailand. The only difference here is that Chef Olay uses the neck of the pig, which is prized for its flavour and tenderness. Cooked on a charcoal grill, the Grilled Pork Neck ($9.80) had a subtle smoky aroma with tender and juicy meat. Have it together with the grilled meat dipping sauce, which adds a spicy kick to the dish. 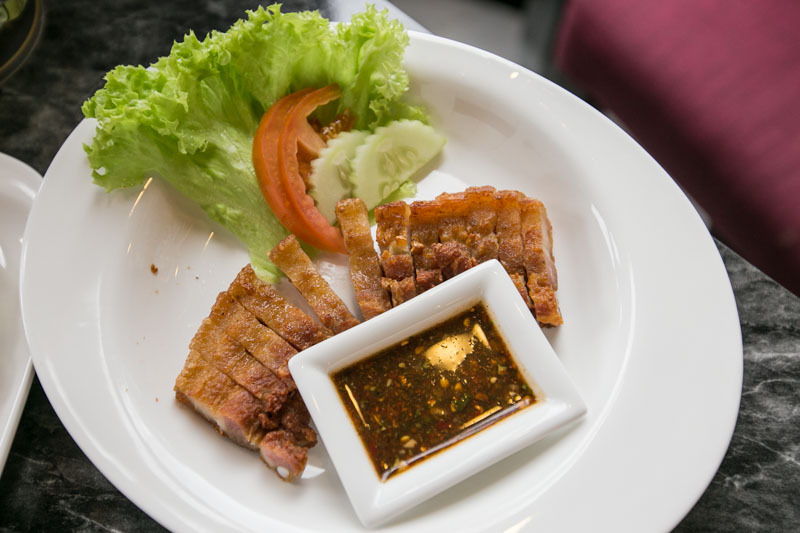 Another dish commonly found on the streets of Thailand is the Deep Fried Pork Belly ($9.80). Thin cuts of pork belly are fried to a crisp and paired with a soy based chilli and fish sauce to give each bite an added oomph! While we enjoyed the crispy and fatty layers of the pork belly, we definitely would have preferred for the cuts to be slightly thicker for a fuller bite. 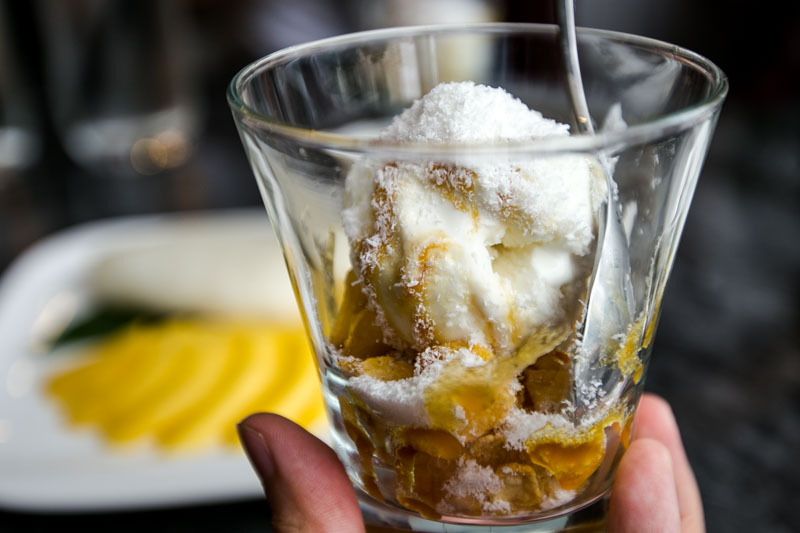 After our hearty Thai Hot Pot feast, we tucked into some desserts to cool our palates down. Apart from the usuals like the Mango Sticky Rice ($5.80), we had the Coconut Ice Cream ($3.80) which comes with cornflakes for that added crunch and a drizzle of gula melaka syrup for added sweetness. Grated coconut is sprinkled on as a finishing touch and for flavour and texture. We thoroughly enjoyed our Royal Thai Hot Pot experience at Soi Thai Soi Nice. The pricing is pretty affordable for the quality of the dishes served here. 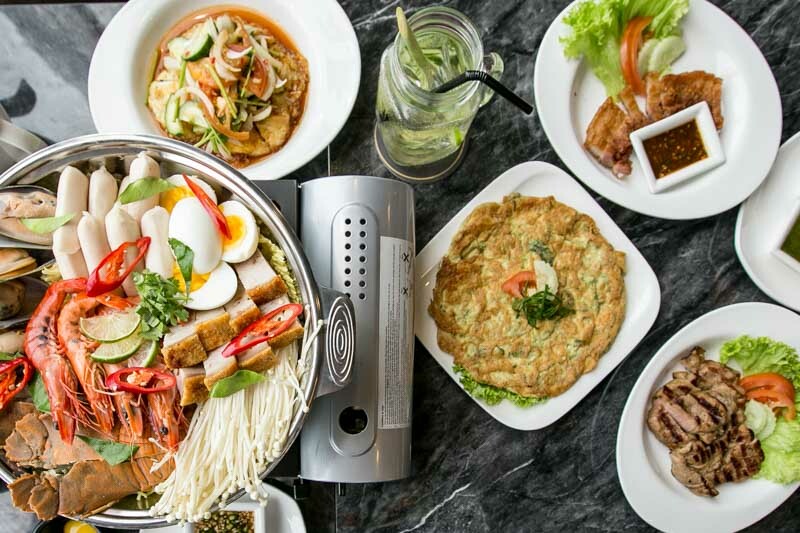 As part of the opening promotion, Soi Thai Soi Nice has a value-for-money lunch set that is going for only $8.80++ which includes an appetizer, main dish and dessert. Do visit them for lunch if you’re in the area.